The Highland Council is to seek the views of local communities on the future of two Highland educational establishments - Kinbrace Primary School and Black Isle Education Centre. Members of the Councils Education, Children and Adult Services Committee have agreed to undertake separate public consultations on proposals to formally close the schools. Learning to become responsible citizens and helping to care for our local community is the theme for a series of events being undertaken by the children of Farr Primary School in Bettyhill, North Sutherland. As a launch activity and also part of their Eco-schools focus, the P1-3 class with teacher Mrs Campbell and P4, 5 and 6 class with Mr Wylie undertook a village litter pick on Wednesday 23rd March 2016. The Highland Council is to seek the views of local communities on the future of Achfary Primary School which has been mothballed since the summer of 2012. Members of the Council's Education, Children and Adult Services Committee have agreed to undertake a public consultation on a proposal to formally close the school. A primary school in the Highlands is looking forward to starting term time with a fresh outlook, thanks to a team from Scottish Hydro Electric Transmission (SHE Transmission). The team of nine joined forces with contracting colleagues from Siemens BAM to repaint the nursery wall and sheds at Gledfield Primary School in Ardgay as part of their Be the Difference day, which enables SHE Transmission employees to take a day away from the office to help local projects. As part of their eco-school activities pupils at Melvich Primary School in north Sutherland spent their last day of term on Friday 4 April 2014 taking part in a litter pick around their village. Many hands make light work so in just a short space of time the young litter pickers were able to fill lots of black bags with discarded items that ranged from crisp packets to glass and plastic bottles. An HMIe report was published yesterday (20 April 2010) for Brora Primary School as part of the inspectorate's ongoing strategy for evaluating the educational provision of local authorities. The report is based on an inspection visit which was carried out in February 2010 and comments on the quality of education at the school. The caring and supportive environment for learning was one of the three particular strengths highlighted by Her Majesty's Inspectors of Education in a report published today on Kinlochbervie High School. Inspectors reported that in most classes, pupils were motivated and very willing to learn and that relationships between teachers and pupils were positive. As part of the inspectorate's ongoing strategy for evaluating the educational provision of local authorities, a report is issued today on the inspection by HMIe of the quality of education at Lairg Primary School. The follow-through report is based on an inspection visit which was carried out in November 2009 and describes the improvements that have been made since the original inspection in 2008. Pupils from Brora Primary will end the term on a high as their school is the first in the North Highlands to be awarded the Scottish Football Association Level 1 Quality Mark in recognition of the high standards continuously maintained by the coaching team. Janitor David Rose and his team of coaches at the 93 pupil school have been coaching football to children for a good number of years and successes have included winning the local schools competition, the Paynter Cup and reaching the last 8 in Scotland for the SFA Soccer 7s national competition. 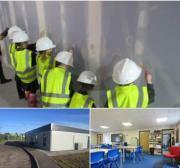 As part of the inspectorate's new joined-up strategy for evaluating all of the educational provision of local authorities, separate reports are issued today on the inspection by HMIe of the quality of education at Dornoch Academy and community learning and development (CLD) in the surrounding area. In a very positive school report, HMIe highlight well behaved and well-motivated pupils, imaginative and well-planned curricular provision, support for vulnerable young people, commitment of all staff and the leadership of the head teacher as particular strengths. A Dornoch Academy student is heading off around the world to help her studies after winning �4000 of support from the Royal Geographical Society-IBG's Learning and Leading Gap Year Programme. Seventeen year old Lynn Munro from Spinningdale in Sutherland has been selected to become one of only twelve students across the UK to receive a grant to undertake a geographical themed Gap Year anywhere in the world. As part of the 'Communities Project for Highland Biodiversity,' P4 to P7 pupils from Tongue Primary School in North Sutherland recently (Mon 12th Jan) had fun planting twenty young native trees, complete with deer guards and wooden stakes. The children worked very hard assisted by Paul Castle the Highland Council Planning and Development Countryside Ranger. Five teams of talented young entrepreneurs from schools in the Highlands have impressed judges from some of the country's leading businesses this week to make it through to the final stage of the ICT Youth Challenge. Sixteen teams of budding young entrepreneurs travelled to the Horizon Scotland, Forres on Tuesday this week where they pitched their ideas for the information communication and technology products of the future. Do You Know Someone Who Needs To Improve Their English? English Language Classes Intermediate to Advanced Level Open Learning for Cambridge and IELTS 6 month course for only �150.00 *Includes: Online tutor support Weekly online lessons 5 hour classes every 6 weeks 2 weekend residential conversation classes in the Scottish Highlands All books and materials Experience and qualified tutors *You may apply for an Individual Learning Account to cover costs up to �200. Visit www.ilascotland.org.uk for more information Starting March 1st 2007 Interested? Contact llcenglish[AT]yahoo.co.uk What is e-English? This is a brand new course aimed specifically at the new members of our community in the Highlands, who wish to improve their already effective English language skills and gain an internationally recognised certification.